Facebook is changing the way our posts reach our fans! You must activity particiapte on this page to continue to see us in your news feed. 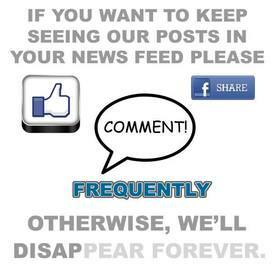 So, please LIKE, COMMENT & SHARE our posts regularly to ensure we do not disappear from your life forever! We truly appreciate each and every one of you, and we want to ensure you can continue to enjoy our page!